World War Brick staff in front of the mosaic built at WWB 2014. Photo by Bill T.
Had awesome workshops on customizing minifigs, lighting models, decal application and more. 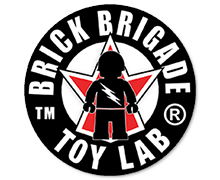 Learned how BrickArms “Reloaded” weapons and made and witnessed the release of new BrickArms weapons and a new Brickmania kit. Will about to release a bunch of new BrickArms weapons. Photo by Bill T.
Saturday night Auction and Raffle. Photo by Bill T.
Throughout the weekend we held several raffles and an auction to benefit the Wounded Warrior Project, for which we raised $5487.00. Thanks to everyone who made this happen, including the sponsors and generous individuals who donated tons of great prizes! Micro Tank Game Tournament Finals. Photo by Bill T.
King of the Hill: Andreas B.
MOC # 7 Sith Holocrons? By Aidan D.
MOC # 13 The Battle of Saipan By Seth C.
Laying a Hero to Rest By Will and David Y.
Normandy Invasion: Omaha Beach By Massimo & Christopher S.
Warehouse Of Destruction By Andrew W.
Lenticular Mosaic By Jeremy F.
Yitzy and Dan revealed their Black Hawk Down diorama at WWB 2014. Photo by Bill T.
If you’d like to see more photos from World War Brick 2014, please see our group on Flickr. Feel free to join in and add your pictures to the group pool! 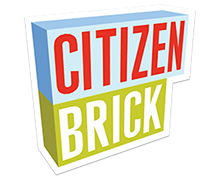 The second World War Brick took place in the Brickmania Toyworks, Minneapolis, MN in June of 2013. Over 100 weekend pass holders and exhibitors participated in the full event, with hundreds more visiting us during the public hours. We had several collaborative builds throughout the weekend—including a massive mosaic—fun and games, a new product unveiling from BrickArms and more. The first World War Brick was held in the 2000 sq ft banquet hall of Amvets Post 66 in Wheeling, IL during June of 2012. It was organized by Dan Siskind, chief model designer of Brickmania Toys. On display were a vast array of military models by Dan and a handful of other modelers, including Ross Scott (aka “Rumrunner”), Brian Anderson, Joe Popelka and Donny Jordan. There were also Brickmania kits for sale, plus products from GI Brick and BrickArms, whose founder, Will Chapman, was also present. People traveled from across the county to visit World War Brick and provided proof that a LEGO military modeling event could be a success. Over 1000 visitors attended the three day event, and $1000 was for veterans’ organizations. Onsite evaluation and attendee feedback suggest the event should be moved to a bigger venue and more opportunities should be provided for community participation. I wish it was back in Chicago. I’d suggest the McCormick Place, where the Chicago Auto Show is held, for more room, but I understand that it would cost a ton to rent it out for a weekend. Having it at Brickmania results in virtually no expenses for the people running the event. Guests at World War Brick get their money’s worth for attending more than any other LEGO fan event we’ve been to. Instead of paying huge money for rent and other overhead, we’re able to give it back to the people who come to WWB.